Corn is classified by the type of starch (endosperm) in its kernels. The premier mill corn of the American South, known as dent (the name derives from the dent that forms on the top of each kernel as it dries), has a relatively soft, starchy center. Dent corn makes easy work of milling–it also makes phenomenal grits. Flint corn, by contrast, has a hard, starchy endosperm and produces grittier, more granular meal that offers an outstanding mouthfeel when cooked. One type of American flint–indigenous to the Northeast–was, and remains, the traditional choice for Johnny cakes. In Italy, flint has been the preeminent polenta corn since the 16th century when Spanish and Portuguese treasure hunters brought Caribbean flint to the Piedmont on ships. This wasn’t my only discovery in this recipe experiment. My attempts to pan fry chunks of the polenta loaf were in vain; the resulting mush was delicious but formless. I kept the shape and got the crust I was after by cranking up the broiler, but if anyone has any suggestions for a stovetop technique, do share it! Bring the broth to a boil in a heavy medium saucepan. Gradually whisk in the cornmeal. Reduce the heat to medium-low. Stir constantly until the polenta thickens, about 5 minutes. Pour the polenta into a greased dish. Cover and let stand at room temperature until set, about 15 minutes. 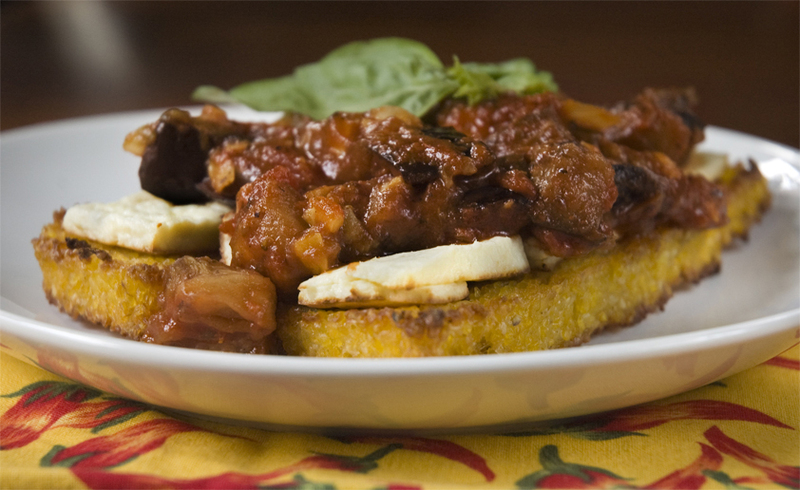 Cut the polenta into squares, top with grated mozzarella, and place under the broiler to toast and melt cheese. Meanwhile, heat the oil in a heavy large frying pan over medium-high heat. Add the chopped vegetables. Season with 1/2 teaspoon salt and 1/4 teaspoon pepper and saute until the juices evaporate, about 8 minutes. Add the garlic. Add the tomatoes and decrease the heat to medium-low, simmer till heated through and all veggies are tender. Remove from the heat and stir in the basil. Season to taste with more salt and pepper and/or hot sauce. Serve the cheesy polenta planks topped with the sauce.